Does your company have a GRC Program? If so, do you feel your GRC program is “mature”? As organizations develop Governance, Risk and Compliance capabilities, the natural push to build a cohesive program drives GRC functions to look at opportunities to leverage processes, share data and streamline efforts. An Integrated GRC program breaks down silos between functional areas and enables common processes, taxonomies and technology infrastructure to both streamline risk and compliance efforts and build a risk aware organization. Where do you start? Attend this session to learn the critical steps to building your organization’s level of GRC maturity. What is your current state, what is the future state and what are the considerations to get from point A to point B to achieve Integrated GRC. 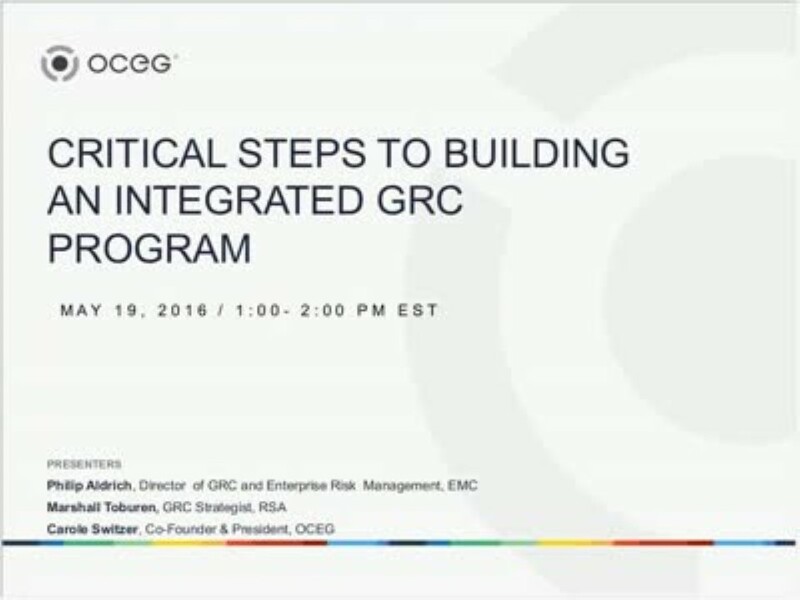 We have emailed instructions to access Critical Steps to Building an Integrated GRC Program to . Make sure the email arrives in your inbox: either add "support@oceg.org" as a safe sender to your email platform, or if you use Gmail, drag our email into your Primary tab.